How Did Law Come to Subvert Order? 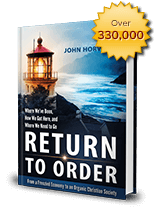 In the book, Return to Order, there is a description of a legal order that came from Christendom. This order was tied to a higher natural law found in God’s law and to which all, rulers and ruled, were subject. This legal order, based on morality, favored order in society and prevented the unleashing of the disordered passions. What we are seeing today is the final phases of a long process by which this legal order gradually became disconnected from our higher law tradition. It is not the case to account in great detail how this legal order was subverted. Suffice it to say that from the thirteenth century onwards, philosophical, cultural and political movements began to arise which sought to sever our link to higher law. The rise of the absolutist kings saw the legists turn Roman Law into a veritable arsenal that disconnected the ruler from the restrictions of both customary and natural law. By the time of the Enlightenment, the West abandoned yet more its higher law tradition with the declaration of the divine right of kings, effectively proclaiming the king free from consultation and even exempt from higher law. It was Thomas Hobbes in his terrifying Leviathan who wrenched law from its moral foundations in eternal law and introduced individual self-interest and fear as the basis for government. It was John Lock who secularized and truncated natural law and turned law into a mere social contract among men in protection of estate and property. It was the French Revolution that swept away the patchwork of organic legal systems and enacted abstract legal codes. Today, we reach the final stages where there are those who would tear down the final stones from our legal foundation and wrench all morality from law. Indeed, there are those who seek to make law serve disorder rather than order. They wish to employ the State to make use of the full force of law against those that profess an objective morality. Nothing must inhibit a man from being his own law subservient to any other, thus echoing the slogan of the student revolts in the sixties who affirmed that supreme paradox: it is forbidden to forbid! With this, the whole edifice of law comes tumbling down. Custom no longer has a place in determining our law. The legislator’s vote overturns the experience of centuries. The judge’s ear listens no more to the past. We are abandoned to our whims, rudderless in a violent sea. This entry was posted in Featured and tagged America, capitalism, Catholic Church, Christian civilization, Christian principles, consumer society, economic crisis, frenetic intemperance, honor, Return to Order, Trust by John Horvat II. Bookmark the permalink.